Challenger A-Comin'? - Cars! Cars! Cars! ...those were the good old days! Man.. $3.00 gas sounds GREAT! I just filled the tank with super in San Francisco, and it was $3.69 a gal. muscle cars mean nothing to me. 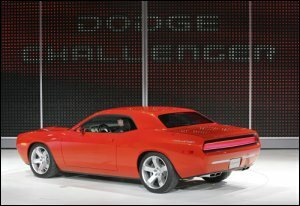 but it is smart to get the Challenger out the door in 2007 if they want to build it at all. again GM with the Camaro will be too slow although it will probably be the better car. "you can work like hell and be Johnny-on-the-spot. but you won't make money selling cars you haven't got." Check out why America loves Chevrolet! !